Julia’s mother actively seeks ways to incorporate Jewish traditions into the lives of her family. She participates in learning opportunities from the community and cherishes the Jewish values PJ Library books instill into each story. Her children have received PJ Library books since they were infants. Recently with the arrival of colorful tzedakah boxes from PJ Library, Julia and her older brother discovered the joys of giving. A valuable lesson learned was that despite their young age, they could make a difference in the world. 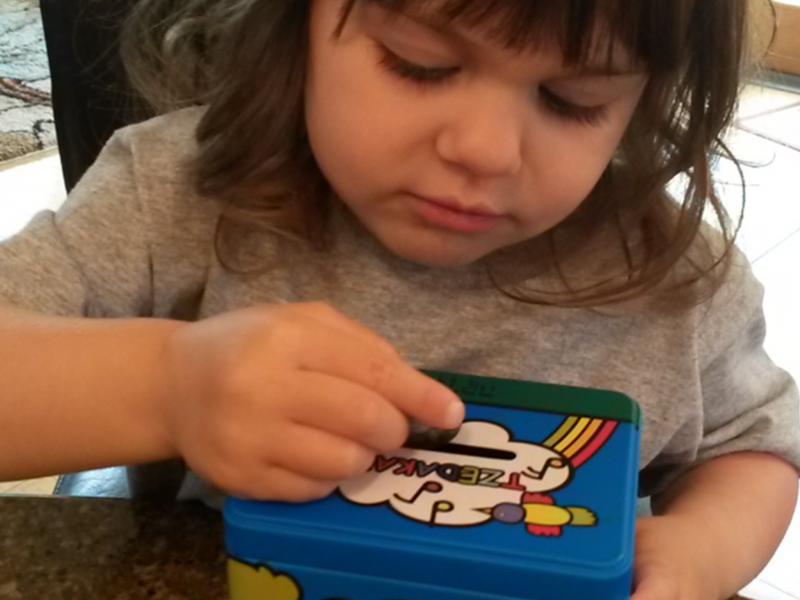 Each week, young Julia places coins in her tzedakah box. Her mother says this is an opportunity to learn that giving is ongoing, something that is done again and again. Placing coins in the box was a much more meaningful experience as opposed to simply writing a check as it offered more opportunities to give. Julia’s mother proudly places her children’s tzedakah boxes on the counter to show that their home is a giving place and to always think of others. PJ Library has given Julia’s family the resources they need to enrich their lives Jewishly. PJ Library in Greater Portland is funded locally by the Jewish Federation of Greater Portland as a gift to our community’s young families (in partnership with the Grinspoon Foundation). We are investing in the Jewish journeys of young families for today and tomorrow. Currently over 1200 children ages 6 months to 11 years receive PJ Library books and music every month.